I’ll be frank with you. THIS. BOOK. IS. SO. MUCH. YES. Y’ALL. It’s so good that I don’t even really know how to review it. Sarah J. Maas’s Celaena Sardothien is my favorite heroine. Ever. And here’s why: Celaena is Elizabeth Bennett with ninja skills. She’s a trained assassin who is girly and bookish. But she’s also arrogant and confident and quick to judge. She is an extremely layered character with a rich backstory, a lot to learn, and a lot of sass to give. But she’s just one component to Throne of Glass. Though the book has been often compared to Game of Thrones, I think the world these characters exist in, Erilea, is much more akin to Camelot than Westeros. Erilea is sort of a mash-up of the Medieval World and the Renaissance: magic has been banned, books have been burned, there’s a despot on the throne, and his son has the power to return the world to normal. And what a son he is. Dorian is a handsome prince with a heart of gold, the need to prove to his father that he’s a man, and his eye on Celaena. He’s good and just and honest and smart. And then there’s Chaol, the oh-so young captain of the guard who is a little more (forgive me for using this word, but) guarded than Dorian is, but still a man who is easy to fall for. But the boys are not the focus of this book: Celaena is. And Maas does such a good job with her that it makes me downright jealous. But you know, what? I’m so glad that Maas has given the world the gift of Miss Celaena Sardothien. She’s the best sort of heroine, one who has faults and has known intense loss and is very fallible (she even has cramps!) and can be duped, despite the fact that she is the best assassin the world has ever seen. And I love love love that she is girly. I feel like so many “heroines” of late are disinterested in fashion because it’s superfluous that it’s extremely refreshing to read a heroine who embraces her girly side and delights in balls and dresses and sumptuous bedrooms and bingeing on candy. Overall, Throne of Glass is an engrossing, gripping tale that will keep you turning the page until you find yourself at the last one. And then you’ll flip to the first page again so that you can relive it all over again. It is, hands down, my favorite book of the year. In fact, it’s one of my favorite books EVER. Bonus: When you’ve finished Throne of Glass, I highly suggest you read the four prequel novellas. Yes, they are prequels, but I think it’s better to read them after you’ve read Throne of Glass. For, you know, perspective. 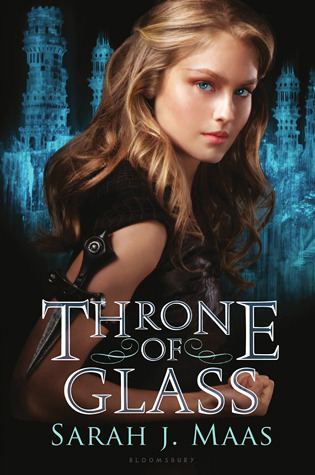 MORE BONUSES: Check out Sarah J. Maas’s Pinterest board for Throne of Glass. It is LEGIT. Hello blogger ! I read your posts everyday and i must say you have very interesting content here.